Investors in LIC's insurance and other schemes are receiving a lower rate of return because LIC is subsidising incompetence at best and malfeasance at worst in institutions such as IDBI Bank and IL&FS, says Jaimini Bhagwati. Over time, the Life Insurance Corporation of India has become the investor of last resort in failing and flailing bank and non-bank finance companies. 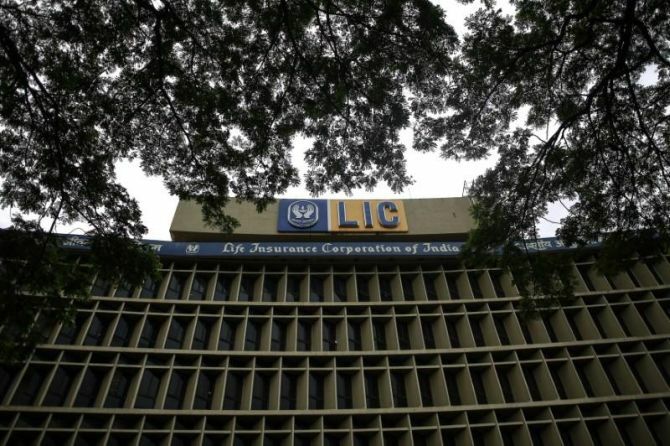 Investors in LIC's insurance and other schemes are receiving a lower rate of return because LIC is subsidising incompetence at best and malfeasance at worst in institutions such as IDBI Bank and Infrastructure Leasing and Financial Services. LIC is fully owned by the Government of India and is regulated by the Insurance Regulatory and Development Authority. IRDAI's mission is to "protect the interests of the policyholders, to regulate, promote and ensure orderly growth of the insurance industry". LIC's foremost priority has to be providing efficient services and high returns to existing policy holders and to widen its reach. By contrast, government is pushing LIC into taking unwarranted risks and IRDAI has been complicit. 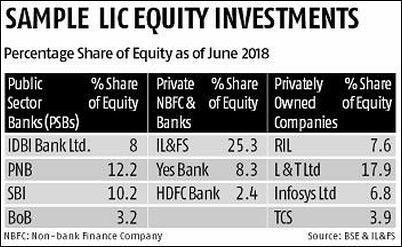 LIC has huge equity holdings in banks, financial firms and companies, both listed and unlisted. The table alongside lists a few of LIC’s investments. LIC's assets under management are approximately Rs 22 trillion and this has come from individual investors in LIC's policies and schemes. LIC's share of the Indian insurance market is around 70 per cent and if it were to be listed it would be the largest Indian company. A substantial proportion of LIC's investments are in government bonds. Hence it is logical for LIC diversify its investment portfolio by investing in stocks as shown in the table. However, LIC has invested in too many public sector banks and institutions which are overexposed to liquidity and solvency risks. That is an obvious disconnect with LIC's core mandate. Anecdotal evidence indicates that when stock markets are under selling pressure, the Indian government directs LIC to buy. And, if banks or long-term lending institutions need capital, LIC is asked to step in. LIC can move stock market sentiment since it buys or sells shares in bulk. It is rumoured that some investors often know in advance when LIC is about to buy or sell specific stocks. The allegation is that these shadowy entities invariably buy/sell the same share a little before LIC does its purchases/sales. The Securities and Exchange Board of India should investigate for front running by checking if there is significant statistical correlation of purchases/sales of other investors with those of LIC over the last 15-20 years. A credible case could be made that LIC should support PSBs in trouble since depositors in these banks need to be protected. In January 2018, CBI arrested senior executives of IDBI Bank and Kingfisher because IDBI had flouted credit limit norms in making loans of about Rs 900 crore to this Vijay Mallya-owned airline. It cannot be in the interest of LIC's policy holders for LIC to provide funding and management support to scam-ridden IDBI Bank. LIC owns 25.3 per cent of IL&FS stock and is the largest single shareholder. IL&FS is an NBFC and cannot take deposits and the argument that deposit holders need to be protected is not relevant in this case. Further, IL&FS is a private firm as is evident from the excessive compensation packages of its top executives. For instance, in FY 2017-18, the chairman, vice-chairman and joint CEO of IL&FS received Rs 9.2, Rs 7 and Rs 6.1 crore respectively as annual salaries (not including highly generous retirement and other benefits). These amounts were about 10-30 times more than the Rs 90 lakh and Rs 30 lakh that the chairpersons of LIC and SBI received respectively as salaries in 2017-18. IL&FS owes about Rs 90,000 crore to its creditors and has defaulted on a small fraction of this debt. For comparison, the gross non-performing assets of all PSBs is ten times higher at around Rs 10 trillion. It must have been known to holders of IL&FS debt that it takes high risks by lending long-term. And, mutual funds should have started discounting investments in IL&FS at least four years back when bank loans over longer maturities started showing up as non-performing assets under RBI's revised guidelines. Ayushman Bharat is designed to provide health insurance to 500 million beneficiaries and was formally inaugurated on September 23 by the prime minister. Yet, there are many who still need life and other forms of insurance and LIC should increase its efforts to widen and deepen its coverage. Thereafter, if LIC has unutilised financial capacity it could boost liquidity in long-term bond markets by investing in municipal bonds which are backed by escrowed earnings. Alarmingly, press reports indicate that in a meeting chaired by the finance minister on September 25, it was decided that LIC and SBI will provide additional financial support to IL&FS. Despite the scare mongering in the media there is no danger of systemic failure in India's financial markets if IL&FS is left to manage its debt servicing on its own. Stock prices have declined recently and the rupee has depreciated because equity markets had risen too sharply and the rupee was hugely overvalued. Consequently, there is absolutely no justification for RBI and IRDAI to be complicit with additional misuse of LIC and SBI to provide yet further funding support to IL&FS. Instead, Orix Corporation of Japan which holds 23.5 per cent of IL&FS equity could be encouraged to provide support since that would lead to greater transparency about the finances of this NBFC. To sum up, the ministry of finance should let institutions such as IDBI and IL&FS fend for themselves and, if necessary, be wound down by RBI in an orderly manner.